The Aston Martin Valkyrie will be one of those über expensive race car toys that super rich people buy and then Instagram. You know the deal. You’re probably also familiar with the people who get in line to buy these kinds of cars first and then flip them for astronomically higher prices for profit. Aston Martin doesn’t want this to happen and has threatened to punish people who do with a kind of... non-punishment? Someone is currently offering up an Aston Martin Valkyrie build slot on Piston Heads and if this tweet is to be believed, they want £9,999,999 for it. 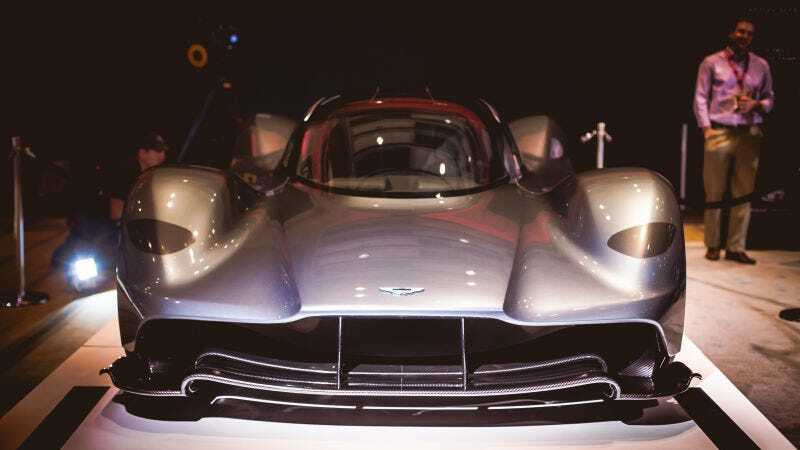 The listing itself is kind of strange because the price is nowhere to be found on the actual page, but, regardless, Aston Martin boss Andy Palmer shut down any possibility of people flipping the Valkyrie. That’s a damn good policy to have... except it only applies to what I assume are “special edition” Aston Martins like the Valkyrie and not “regular” Aston Martins. If that’s true, then the best case scenario for the flipper would be to make millions off of the Valkyrie and then just continue living life with full access to things like the DB11. Not a terrible problem to have. So why can’t you buy an F50 out­right? Well, it isn’t because all 55 of the U.S. allotment has been spoken ton. It’s because the whole passel of F50s was offered only via a two-year lease whose various articles and cod­icils were fashioned by Ferrari North America (FNA). Even if you possess the requisite $240,000 down pay­ment for the lease (not to mention sales tax and luxury tax), and even if you also are sufficiently affluent to swing the 24 payments of $5600 per month, you’ll still have to summon a $150,000 final payment—again, two years down the cash-littered road—before you can truthfully refer to yourself as an F50 owner. According to Ferrari North America, this lease-it-or-leave-it scheme is in place simply to weed out avaricious speculators. The practice even worked its way over to Ford, which is keeping a close eye on its new Ford GT customers to make sure nobody is flipping the cars. So, if any readers out there get funny ideas about selling their Valkyries for profit, here’s a tip: don’t. Because you won’t be able to buy the next super expensive Aston that comes out. And that would be a really tragic loss.